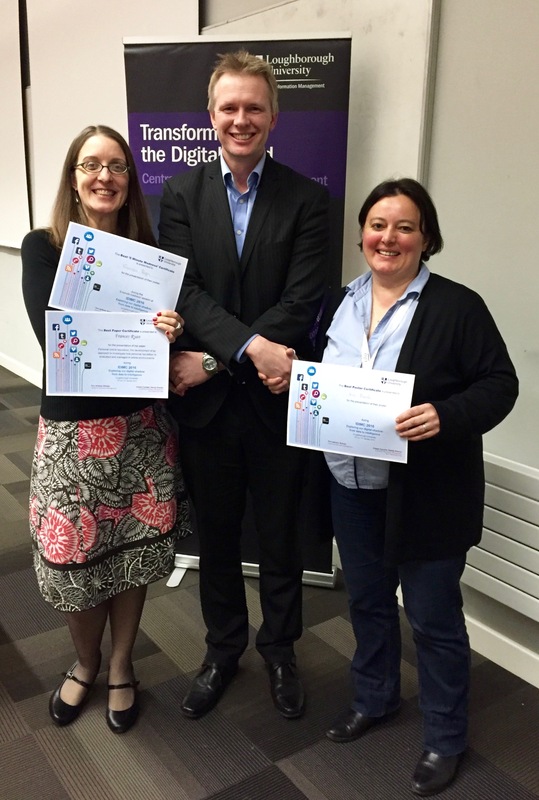 2016 got off to a terrific start for the Centre for Social Informatics with three award-winning ‘performances’ at the 2nd International Data and Information Management Conference (IDIMC), hosted by the Centre for Information Management at Loughborough University on 12th and 13th January. The best contributed paper (open to all): This was awarded to Frances Ryan (and co-authors Peter Cruickshank, Hazel Hall and Alistair Lawson) for a paper entitled Personal online reputation: the development of an approach to investigate how personal reputation is evaluated and managed in online environments. 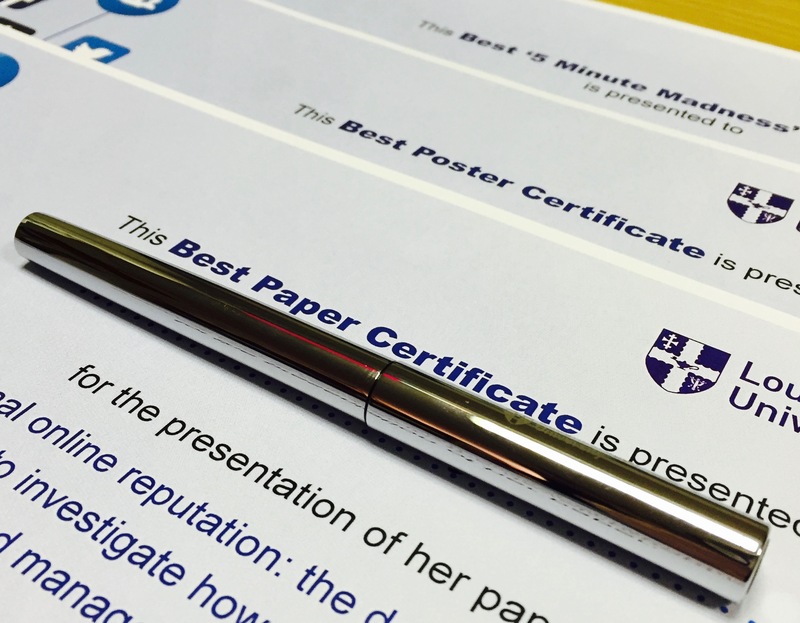 The paper was selected for the award through the anonymous peer review process to which all contributions were subjected prior to the conference. delegate votes at the conference. The best PhD student presentation (open to those who presented the broad themes of their doctoral work in 5 minute madness format): This was (also) awarded to Frances Ryan. Other highlights of the conference included some excellent invited papers. I particularly enjoyed meeting and hearing from Danny Budzak of the London Legacy Development Organisation, not least because we used a paper that he published in Business Information Review in my Knowledge Management class last semester. Danny made some very interesting observations about personal information management systems, such as this one favoured by Al Gore. It was also great to see Professor Christine Borgman, and for her to see us, as she delivered the closing keynote paper of the conference over Skype from California on themes from her latest book Big data, little data, no data: scholarship in the networked world. 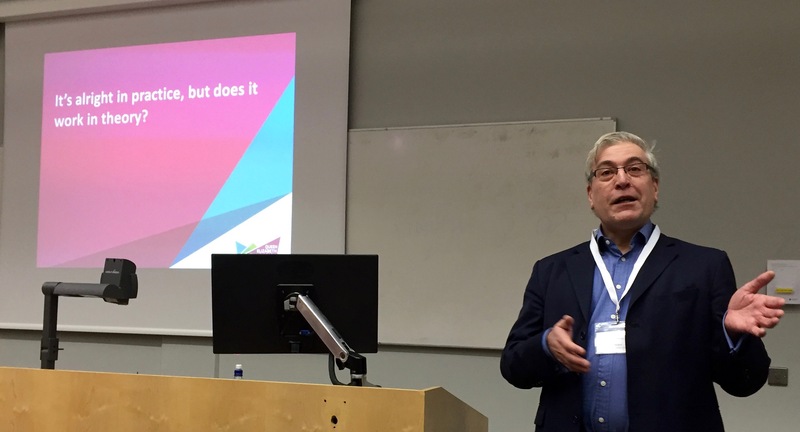 Of the workshops that I attended I gained most from Professor Bob Galliers’ session in which we critiqued his 1991 paper published in Information Systems Research entitled ‘Choosing appropriate Information Systems research approaches: a revised taxonomy’. It was interesting to see which research approaches have stood the test of time, and identify more recent developments that did not feature in the original paper (e.g. mixed methods as a valid research approach). 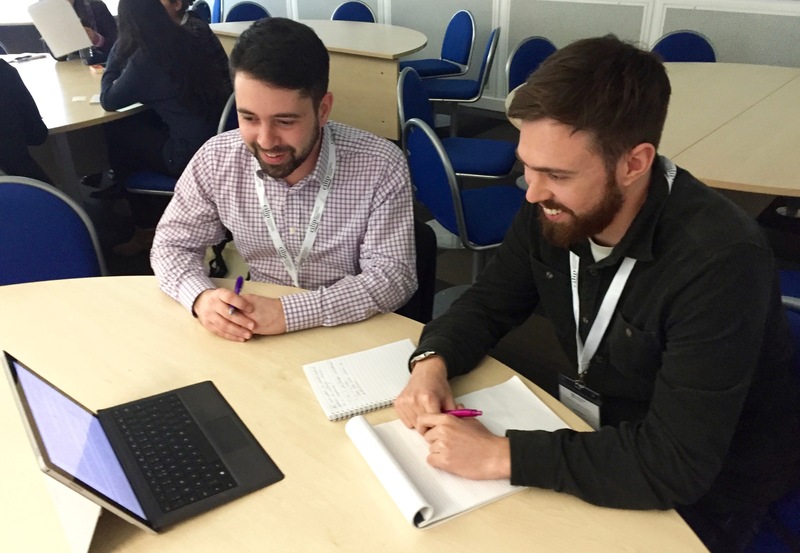 I also welcomed the opportunity to get to know Loughborough PhD student Josh Morton and one of his supervisors Dr Alex Wilson in this session as we focused our discussion on the applicability of particular methods to Josh’s own project. Of course much of the benefit of a conference such as this is meeting up with ‘old’ colleagues and collaborators. I very much enjoyed seeing many people with whom I have worked in the past, such as Dr Louise Cooke, Professor Maria Burke, Dr Janet Harrison, and Dr Adrienne Muir (who is about to start her new role as Professor in the Department of Information Management at Robert Gordon University). It was also great to get to know a range of people who, we hope, we’ll see again in the future. These include Sina Joneidy (Salford University); Adedoyin (Lush) Olusina (Nottingham University); Sonia Ramdhian (CILIP – the conference sponsor); and Ming (Vincent) Zhan (Åbo Akademi). 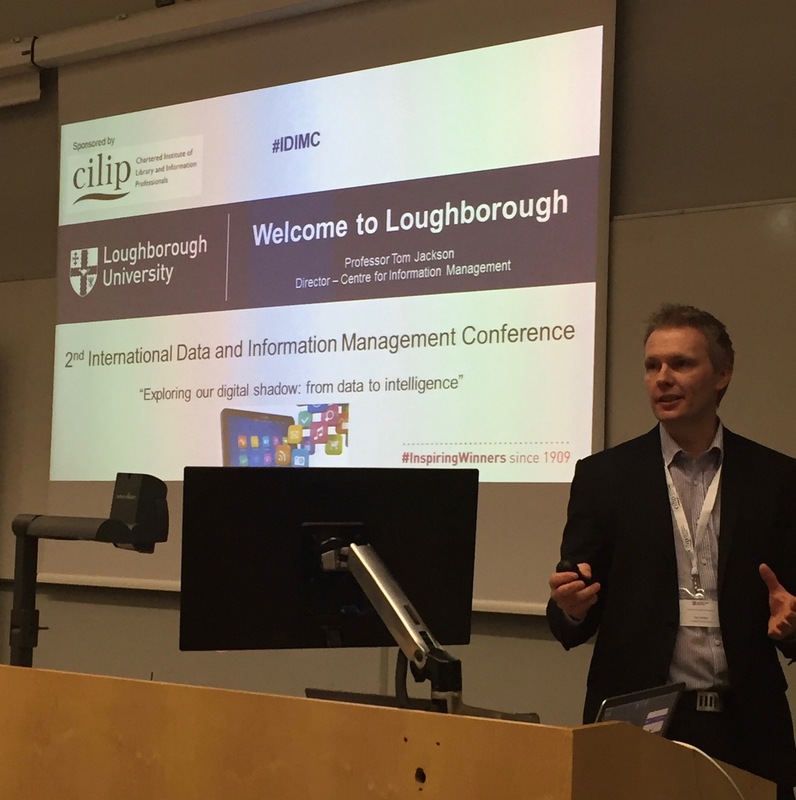 Thanks are due to Professor Tom Jackson’s fantastic team in the Centre for Information Management at Loughborough who pulled the whole event together and ensured that everyone enjoyed – and learnt a lot at – a great conference. Further information related to the work of presented at IDIMC by the three PhD students from the Centre for Social Informatics, as well as their own conference reviews, can be accessed through the links below. This entry was posted in Awards, Events and tagged 2nd International Data and Information Management Conference, Adedoyin (Lush) Olusina, Adrienne Muir, Alex Wilson, Alistair Lawson, award, Bob Galliers, Centre for Information Management, Centre for Social Informatics, Christine Borgman, CIM, CSI, Danny Budzak, Edinburgh Napier University, Frances Ryan, idimc, Iris Buunk, Janet Harrison, John Mowbray, Josh Morton, Loughborough University, Louise Cooke, Maria Burke, Ming (Vincent) Zhan, Neil Stansfield, online reputation, Peter Cruickshank, Peter Robertson, PhD, prize, research, RGU, Robert Gordon University, Robert Raeside, Sina Joneidy, Sonia Ramdhian, Tom Jackson by Hazel Hall. Bookmark the permalink.